Healthy Living Kids is a subscription that helps kids ages 3-13 live healthier. They offer a $10.95 a month snack box and a $35.95 a month bigger box with snacks, toys, activities, and tools for healthier habits. 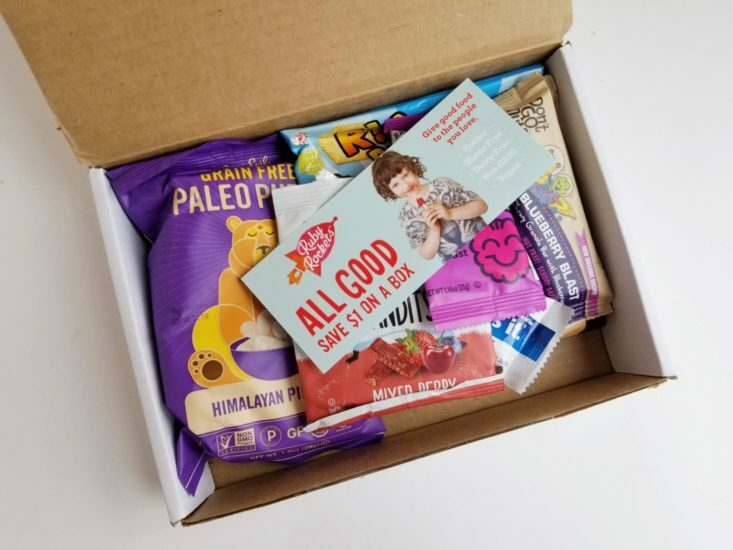 This is a review of the $10.95 a month Snack-only Box. The Products: 5-6 snacks/month, all approved by their registered dietitian. The first thing I pulled out of the box was a coupon for $1 off a box of Ruby Rockets popsicles. This nut-free bar is a chewy, crispy granola bar, almost like Rice Krispies. It has blueberries in it for a fruity sweetness. This was pretty good! I’ve heard a lot of hype around RxBars, but I have never tried them myself. This is one of their kids bars, made only with 2 egg whites, 4 almonds, 5 cashews, and 1 date, plus strawberries, raspberries, and blueberries. We didn’t love this one. The flavor was just okay, and the texture was soft with different chewy berry pieces in it – it just wasn’t a winner for me or my son. All this bar is made of is 1 apple and 20 blueberries! I love that. The texture was okay here – it felt like not-quite-dehydrated fruit? Which, I mean, is probably accurate. I’m not sure, but my son didn’t like this. I thought it was alright but I wouldn’t reach for this first for a snack. These fruit and veggie stix were good! The texture wasn’t exactly chewy like gummies but it was close. I told my son they were fruit gummy sticks and the was all about them. I thought they were flavorful and tasty. These were our favorite snack in the box! They’re puffs made with nutritious starchy root veggies like sweet potatoes and cassava root, tossed in coconut oil and Pink Himalayan Salt. The texture is perfectly crunchy and the flavor was really good. These are pretty plain, sea salt crackers. The flavor was good! They almost reminded me of pita chips because they would have been good in some hummus. Unfortunately, they came really crumbled up into tiny pieces. We could still sample them fine but they were difficult to eat. Verdict: The Healthy Living Kids Snack Box was a fun box to go through with my kids. I hadn’t tried any of these before, and I discovered some new good snacks for my boys and me. Our boxes are shipped on the 15th of every month. Value Breakdown: At $10.95 for this box, you are paying about $1.83 per item. Check out the best kids subscription boxes of 2019! What do you think about the Healthy Living Kids Snack Box? Have you tried the full box? I’m obsessed with That’s it. bars. I think I got the first one from Snack Nation or Love with Food. I really recommend Apple Strawberry & Apple, Mango & Chili.